The notion of family is incredibly important within all cultures, yet while ‘Western’ countries have dealt with the breakdown of the family unit for several generations it is only in the last decade that Korea has seen an enormous rise in the national divorce rate. Due to the highly competitive culture and emphasis on diligence and financial earnings, such divorces often result in the ignorance, or outright abandonment, of the children and their needs as parents strive in the workplace or seek pastures new. 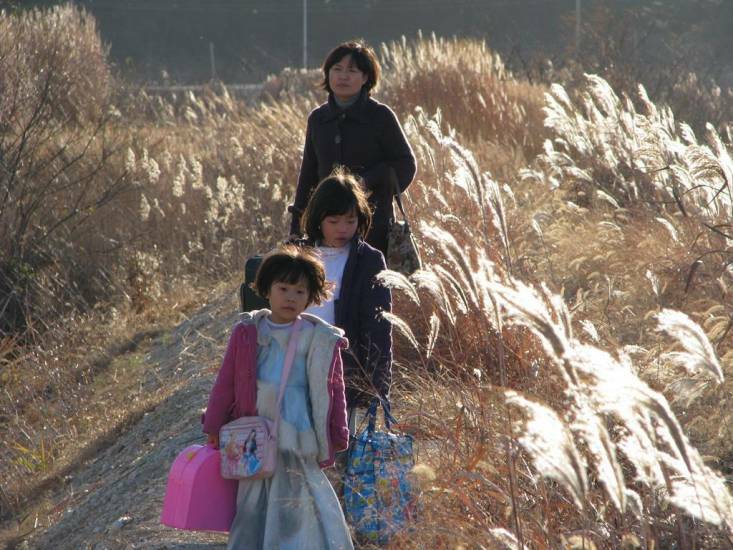 Treeless Mountain (나무없는 산), the second feature written and directed by Kim So-yong (김소영), explores the lives of two such children with elegance, grace, and poignancy. The simplistic narrative allows the director to convey every emotional nuance from the young actresses, resulting in an outstandingly heartfelt drama of loss and the desire for kindness, the effects of which stay long after the closing credits. At seven years old, Jin (진, Kim Hee-yeon (김희연) is developing well at school and is beginning to display keen intelligence. Yet when school is finished, she must rush home to take care of her younger sister Bin (빈, Kim Seong-hee (김성희) until their mother (Lee Soo-ah (이수아) returns from work. Struggling financially, their mother decides to leave Jin and Bin with their aunt (Kim Mi-hyang (김미향) while she looks for their father, promising to return when their piggy bank is full. Distraught, Jin and Bin set out to earn enough money to fill their piggy bank, and await the return of their family unit. Writer/director Kim So-yong (김소영) does a masterful job in conveying the unkind world inhabited by youngsters Jin and Bin. Jin in particular receives the most focus and is the heart of the film, old enough to understand that changes are occurring within her life yet too young to comprehend why. Jin’s intelligence in school, as well as her lack of self-confidence, are wonderfully conveyed only to be later poignantly contrasted with her parental role as caretaker of her younger sister Bin. Her resentment of the role is amazingly restrained, while her heartache as Bin receives more attention and affection from their mother is heartbreakingly sincere. Such subtle emotional responses are expertly captured by Kim So-yong, with her highly effective and consistent use of close-ups and extreme close-ups making for a simultaneously riveting and a borderline claustrophobic experience, forcing the audience to engage and empathize with the young girls. While Jin almost instinctively takes on the role of responsibility, Bin is excellent in attempting to ignore the sense of abandonment and pretend everything is fine, as exemplified by her princess dress which she constantly wears. She is delightfully optimistic and treats her mother’s abandonment as a quest or game, the completion of which involves filling a piggy bank full of coins by any means necessary. Jin and Bin’s childhood logic in fulfilling the task set by their mother is comical, endearing and tragic, making their plight ever more compelling. As well as depicting the story of the two young girls, Treeless Mountain is a scathing account of the contemporary absence of parental responsibility. Jin and Bin’s father never appears within the film, and while their mother is caring she also treats Jin unfairly, as well as failing to return to her children as promised. While the situation is never made clear, the mother’s quest of finding the father of her children is her ultimate goal and decides to stay with him – the man who abandoned his family – rather than return to their children. Similarly, the aunt who takes responsibility for Jin and Bin during this time is woefully inept, using money to drink alcohol rather than on food for the hungry youngsters. It is only the mother of a disabled child and Jin and Bin’s grandmother who are portrayed as understanding the nature of parenting, clearly stating that parental responsibility is a specialist comprehension that is shockingly absent in contemporary society. Kim Hee-yeon (김희연) is absolutely enthralling as Jin, giving an astonishing performance for such a young actress. She completely shines in every scene and conveys a startling array of emotional depth throughout the film. Her intelligence, shyness, and her desire to play and live the life of a child are wonderfully performed, yet the young actress really excels during more dramatic events that reveal her animosity and resentment towards her situation, lashing out at younger sister Bin in moments of frustration and later subtly expressing guilt through kindness. Throughout Treeless Mountain, Kim Hee-yeon performs with utmost sincerity. As younger sister Bin, Kim Seong-hee (김성희) is also wonderfully endearing. Her childish optimism and logic are a joy to watch, as is her boldness which helps her and her reluctant older sister during times of hardship. Her innocence and naivety are excellent counterparts to Jin’s growing awareness and cynicism, and the co-dependency they share in their relationship is elegantly symbiotic. Writer/director Kim So-yong has crafted a beautifully poetic tale of the hardships of childhood in Treeless Mountain (나무없는 산), with incredibly endearing performances by the two young leads that are conveyed with a startling level of sincerity. The film is one of the few to tackle the concept of the breakdown of the family unit from the perspective of the children, lambasting parents who renege on their responsibilities yet emphasizing the resilience and adaptability of the youngsters. Treeless Mountain is an elegantly poignant film about the desire for kindness in a cynical world, and is an absolute delight.